The artist as a young man; Agemian’s self-portrait. Ariel Agemian’s artistic career started in France. 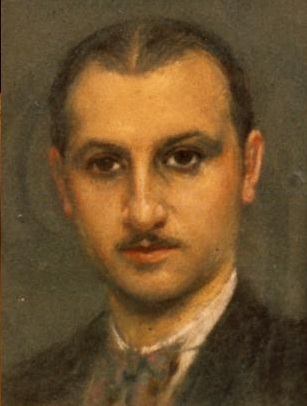 During the period 1931 to 1938, his paintings were appreciated and widely exhibited in Paris, Vienna, Venice and Milan. He was primarily concerned with religious art and profane subjects. Born Haroutin Pascale (Ariel) Agemian, he began to paint prolifically after resigning as art professor at the Moorat College in Sevres, France. Agemian’s mural technique reflected the influence of old masters such as Titian. As time went on, he showed himself to be versatile, equally at home with small compositions as well as monumental murals. Subjects included portraits, still life, landscapes and life experiences, nudes, religious art, scenes of battle and beauty. His portraits were of dignitaries from the political, religious and entertainment world. They included Giovanni Martinelli, Louis Germain-Martin, French Finance Minister, and he was most honored to paint Pope Pius XI and Cardinal Agagianian. A deeply religious man, Agemian was still nourishing the seed of a priestly vocation. He also wanted to spend some time in America and study the American people for a series of tableaus on democracy. Thus, he decided to spend several months in the United States. This move, in 1938, signaled the start of a new era for the young artist. An art exhibit in 1939 in New York was described as one of the most extraordinary assemblages to be seen on art gallery row in a long time. Critics proclaimed that the artist revealed a diversifying talent with the ability to deal with formal organization, a nice color sense and a generally romantic approach. They noted that he was obviously trained in European traditions of sound craftsmanship. He perfected the use of pastels on construction paper and working with the dark to light concept. On black construction paper, he used white chalk and brought life from the black background. Ariel married Maria Roxas in June, 1939. They had a son, Stefan, and a daughter, Annig Agemian Raley. In 1943, Agemian became an American citizen, and he began to work for the Confraternity of the Precious Blood, a publishing house for Catholic literature in Brooklyn, New York. Agemian painted over 500 illustrations. They are in the books My Daily Psalms, Christ in the Gospel, The Imitation of Christ, My Meditation on the Gospel and My Mass. 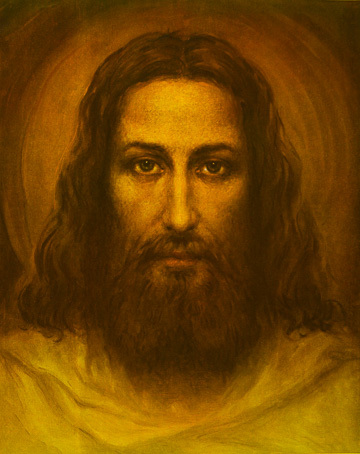 His reproduction of Christ, from the Shroud of Turin, is considered the most exact by experts in the scientific research field. After coming to America, the artist’s technique and subject matter noticeably changed, becoming purely religious. Only a few portraits of dear friends were painted during the next twenty years. He sketched daily and lived somewhat the life of a recluse. Although his paintings were always on display at his home in Brooklyn, his works were not displayed publicly after 1939. In 1958, Ariel Agemian was given the highest honor bestowed upon a layman by the Catholic Church. He was awarded a Gold Medal from Pope Pius XII and knighted into the Order of Saint Gregory. In March 2012, he was posthumously honored as a distinguished alumni by the Mekhatarian Alumni Association. His legacy lives on in his works. There have been several showings in the Grand Junction and Glenwood Springs area in Colorado. Some religious works have been donated to Museums in New York City, Holy Cross Armenian Catholic Church in Belmont, MA, St. Mark’s and St. Bernard’s Church in Philadelphia, PA. and Erevan, Armenia. In 2011, the painting Christ in the Temple was donated to Anna Maria College in Paxton, MA, from where his daughter graduated. Haroutin (Ariel) Pascale Agemian was born in Brussa, Turkey. In 1926, he graduated from the Venice Academy of Fine Arts with a Gold Medal Award from the Associazione Artistica. Up to 1931, he worked and taught in Italy. From 1931 to 1938, Agemian taught in Paris. Ariel Agemian was a representative of the school of academic realism and a skillful master of composition. Agemian painted national themes reflecting both the ancient and contemporary history of the Armenian people. He was frequently inspired by the distinct decorative-allegorical paintings of the Italian Renaissance. Agemian was both a distinguished portraitist and a landscapist. He painted murals with both spiritual and secular themes. Agemian’s works can be found on display in Armenian and Eastern Rite Catholic Churches in France, Italy, Turkey and Canada. In the United States, they can be found in Belmont and Roxbury, Massachusetts and in New Broomfield and Wynnewood, Pennsylvania. In addition, Agemian’s paintings are displayed in the Mekhitarist College in Venice, at the Monastery on the Island of San Lazzaro, and also in the homes of several friends in the USA. The artist’s daughter, Annig Agemian Raley, lives in Glenwood Springs, Colorado, where she curates the artist’s paintings and also teaches piano and yoga. The artist’s grandchildren, Rita, Howard, and Ariella have inherited their grandfather’s creativity and love of literature.